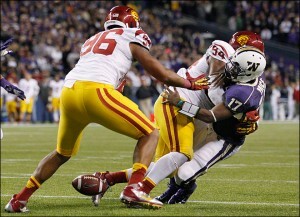 That’s what USC did against Washington. They won, baby! Matt Barkley and his receiving corps have had better games, but the running game was productive with Silas Redd and Curtis McNeal rushing for 155 and 58 yards, respectively. The defense was key to USC’s win, and they put on a show. Two interceptions, two forced fumbles, a blocked punt returned for a touchdown, and too many sacks to count secured a Trojan victory and prevented the momentum from shifting in the Huskies’ favor. The margin of victory could have been greater, but a 24-14 win is a better result than the last time the Trojans visited Seattle in 2009. Besides, USC won’t play the Huskies again (in the regular season) until 2015, so let’s enjoy this “farewell” victory and the highlights. all year. The offensive guru is very lacking needs to get creative.